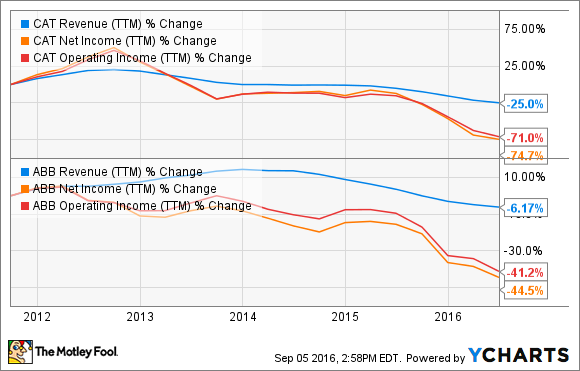 Better Buy Today: Caterpillar Inc. vs. ABB Ltd. Between ABB and Caterpillar, one stock looks surprisingly cheap today. ABB's technology helped Solar Impulse 2 complete its round-the-world flight. Image source: ABB and Solar Impulse. ABB (NYSE:ABB) and Caterpillar Inc. (NYSE:CAT) are into very different businesses, but both stocks have had strikingly similar run-ups this year, gaining roughly 20% each year to date as of this writing. However, that doesn't mean ABB and Caterpillar will continue to head in the same direction -- let alone grow at the same pace in coming years. In fact, while one of the stocks could struggle in the near future, the other looks pretty cheap at today's price and could offer investors great value for money in the long run. Curious? Before I reveal the potential out-performer's name, and in the interests of building my case, let's learn a bit about ABB's and Caterpillar's businesses and see where they stand on the global map today. When we're talking about ABB and Caterpillar, we're referring to two stalwarts that dominate their respective industries. Caterpillar is the world's largest manufacturer of construction and mining equipment, gas turbines, diesel and natural-gas engines, and locomotives. The company runs three business segments -- construction industries, resource industries, and energy & transportation -- while also providing financing services through its financial products division. Caterpillar has more than 300 products in its portfolio and is present in more than 180 countries today. You have a fair idea about ABB's and Caterpillar's businesses now, but do you know which company has delivered superior returns in recent years? While both ABB and Caterpillar are cyclical businesses, Caterpillar has been hit harder during a downturn because of the substantial exposure of its resource industries (mining) and energy and transportation segments to the commodity markets. Not surprisingly, Caterpillar's profits plunged as prices of key metals and oil tumbled. The mining industry is still in the doldrums, and oil companies are slashing capital expenditures aggressively. That leaves little hope for a recovery in Caterpillar's fortunes anytime soon. Mind you, ABB also serves oil and gas and mining sectors. But demand for its electrical equipment and power transmissions businesses is relatively stable as reliable power supplies are sought after irrespective of business cycles. Moreover, as a key player in automated solutions, ABB is one of the top companies to ride the emerging Internet of Things wave -- a tech trend poised for massive growth in the years to come. One of the finest examples is ABB's alliance with Solar Impulse 2, the solar-powered plane that completed its round-the-world flight earlier this year. In other words, I believe ABB's dominance in automated solutions and heavy reliance on utilities for revenue should give it a strong lead over commodity-centric companies like Caterpillar in coming years. ABB is also financially well-equipped to ride the growth. ABB's profits might have come under pressure in recent years, but management has proved its mettle time and again in converting profits to free cash flows. So while Caterpillar's FCF is down by one-third in the past five years, ABB has, ironically, grown its FCF by exactly the same percentage during the period. 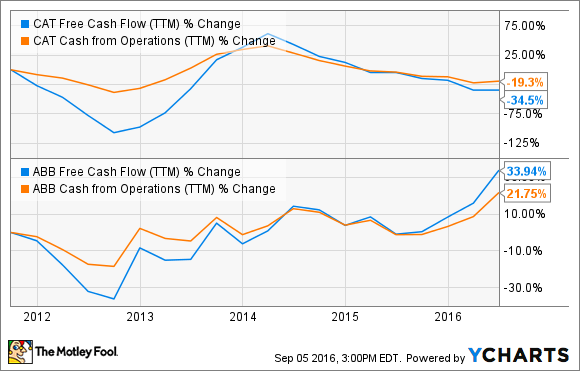 CAT Free Cash Flow (TTM) data by YCharts. ABB's balance sheet is pretty strong, too, with a debt-to-equity ratio of only 50% compared to Caterpillar's 160%. Caterpillar's heavy-equipment business, however, is highly capital intensive, so its high debt levels aren't surprising. That said, Caterpillar earned only 5% and 8% returns on the capital it invested in 2015 and 2014, respectively. Comparatively, ABB's ROIC for 2015 and 2014 stands at 9% and 11%, respectively, proving it is better at unlocking value from its investments than Caterpillar. But is ABB as adept at rewarding shareholders? Interestingly, both ABB and Caterpillar have generated greater FCF than net income in the past couple of years, and both companies have also been equally committed to shareholders, having aggressively raised dividends and repurchased shares over the years. However, I'm going to give Caterpillar brownie points for its solid FCF and dividend track record despite the massively challenging business conditions. Moreover, Caterpillar's dividend yield of 3.8% edges out ABB's 3.4% yields, making it a winner when it comes to rewarding shareholders. Valuation: ABB wins, hands down! 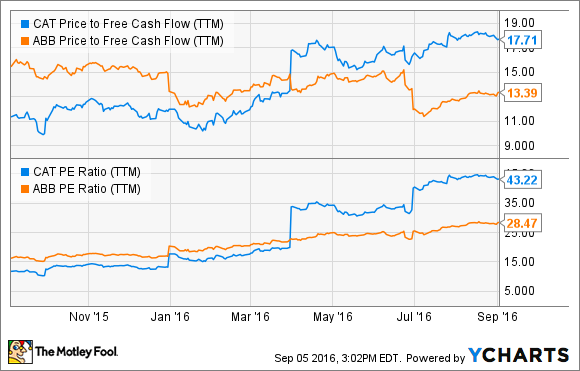 CAT Price to Free Cash Flow (TTM) data by YCharts. ABB is trading at a significant discount to Caterpillar on both a trailing earnings and FCF basis. Of course, Caterpillar could run much higher when the business cycle turns, but it could also be a long and painful wait for investors. For now, ABB looks like a steal given its superior performance and growth catalysts.